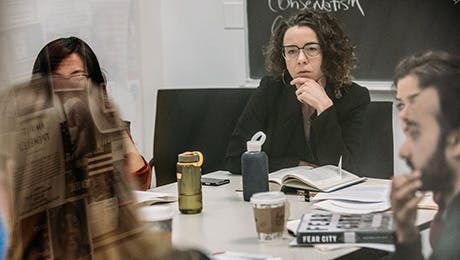 VIRAG MOLNAR received her Ph.D. from Princeton University and is currently Associate Professor of Sociology at the New School for Social Research. She has written extensively about the relationship between architecture and state formation in socialist and postsocialist Eastern Europe, the post-1989 reconstruction of Berlin, the new housing landscape of postsocialist cities, and the street art scene in New York, Berlin and Budapest. Virag's book Building the State Architecture, Politics, and State Formation in Postwar Central Europe (Routledge, 2013) received the 2014 Mary Douglas Prize from the American Sociological Association. Her work has also appeared in the American Sociological Review, Annual Review of Sociology, International Journal of Urban and Regional Research, and Urban Studies. She has been a visiting fellow at the Minda de Gunzburg Center for European Studies at Harvard University and the Humboldt Universität in Berlin. Her research has been supported by the National Science Foundation, Alexander von Humboldt Foundation, Marie Curie Intra-European Fellowship, the American Council of Learned Societies, and the American Academy in Berlin, among others.